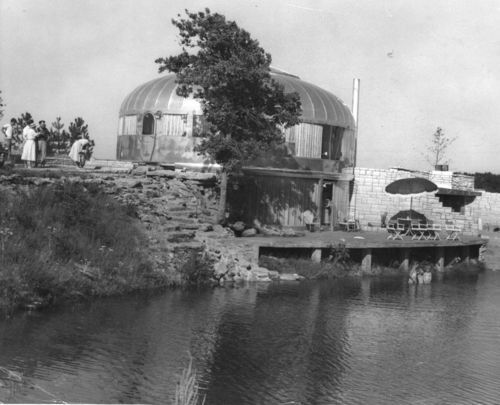 This black and white photograph shows the prototype of a dymaxion house designed by Richard Buckminster Fuller. The word dymaxion means DY (dynamic), MAX (maximum), and ION (tension). The house, constructed in Rose Hill, Kansas, was made of aluminum and used tension suspension from a central column or mast. This model was one of only two prototypes ever produced. Fuller hoped to convert the Beech aircraft factory in Wichita to produce these houses to give returning veterans jobs and to help resolve the shortage of homes following World War II. In 1991 the William Graham family donated it to the Henry Ford Museum & Greenfield Village in Dearborn Michigan.